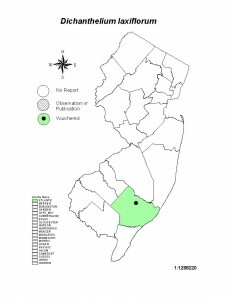 Comments: Dichanthelium laxiflorum is a new addition to New Jersey’s flora. 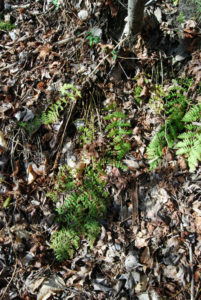 This SE US rosette grass species is relatively frequent on open dry sandy loam soils of the Coastal Plain north as far as Maryland’s Inner Coastal Plain, specifically on the western Chesapeake Bay shoreline. I first discovered this species serendipitously in late summer 2005 north of Egg Harbor City, Atlantic County. The population occupied a disturbed roadside and an adjacent vacant lot at the intersection of Duerr and Havana Avenues. 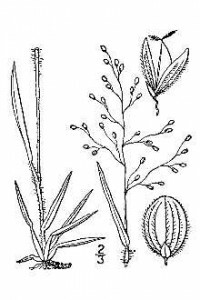 The plants mixed with Dichanthelium dichotomum, Dichanthelium commutatum v. asheii and one of the varieties of Dichantelium acuminatum. Today, the site supports an educational use. 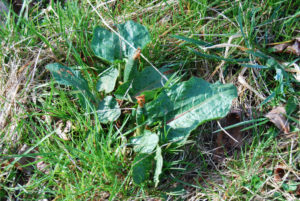 The species was relatively frequent within the old field prior to its destruction, and its presence somewhere else in the vicinity is expected. Reference Specimen: Open gap in oak-pine woodland, Duerr and Havana Avenues, 2005, J.R. Arsenault, #1977, Egg Harbor City, Atlantic Co, NJ.